Manufacturer of a wide range of products which include eye mask / pads, vetiver / loofah scrubber, bath bombs, natural scrubs / ubtan jars, buckwheat pillows and bath salts. Eye masks can be put inside refrigerator for chilling. They retain cooling effect for 10-15 minutes. For warm effect, they should be put on hot water. Eye masks provide instant relief for tired eyes, especially after a long day at work. They are also useful after watching TV or mobile for a long time. Regular use of eye mask helps in reducing dark circle. Eye masks also reverse aging process as they work on fine lines and wrinkles around eyes known as crow’s feet. Eye masks helps you rejuvenate and unwind from stress. Eye masks reduce the puffiness around eyes which could be due to lack of sleep, malnutrition or other issues. Suggested uses: They can be used for soothing itchy eyes. They help in providing relief from conjunctivitis. Eye masks can be used warm, suitable for providing relief in sinusitis and cold. Gel eyes masks- These masks are made of soft translucent silicon material in double eye shape filled with gel. This gel retains the cold effect for some time when put in fridge. This gel can be water based or Aloe vera based. It can be made in different colours and shapes. These masks will have adjustable velcro straps or elastic band for different face size. These masks can also have a cover made of silk/satin for smooth feeling. Gel masks are also available in magnetic inserts for better blood circulation. Dark sleeping eye masks- These masks are created especially for blocking light providing completely dark for eyes to ensure better and sound sleep. They are very useful while travelling as they help people sleep in airports, taxis, buses etc. They can block from 50% to 100% light and help brain detect darkness to induce sleep. These masks can be made in cotton, satin or silk for luxurious feel. These can be made in different colours and shapes. These masks have adjustable straps for different face size. Eye pillows- These masks are made with cotton/silk/satin/blends. They are usually filled with flaxseed mixed with different herbs like lavender, peppermints etc. Flaxseed provides mild acupressure effect for stimulating and relaxing muscles around eyes. Eye pillows can be infused with aromatherapy oils. For cooling effect, they should be kept in refrigerator for sometime before use. They provide a relaxing and soothing experience. These can be designed in different materials and colours. Masks with pocket inside- These eye masks are made with a pocket inside for keeping herbal/aromatherapy pouches. 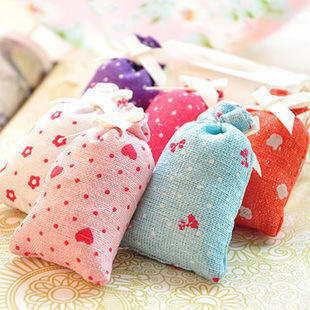 These pouches can be of various fragrant herbs like lavender, rose etc. These fragrances can be intensified with applying 1-2 drop of essential oils/blends. When mask in use, these oil will be inhaled for their therapeutic benefits. These masks are usually made of cotton for maximum aroma release. Packaging: Gingerly is a one place site featuring some of the most exclusive eye mask. Packaging is the crucial stage to maintain the safety and quality. We use advanced packaging solutions that meet hygiene standards and ensure product quality. Private labeling: We offer packaging of eye mask with a variety of packaging options that are labelled with your brand name. We understand the needs, share and propose ideas, support design and packaging options. With our in-house packaging ability, we monitor the whole process. Vetiver (also known as Khus or Lavancha) have been used traditionally in India for its cooling and calming properties. Vetiver roots are aromatic, antiseptic and sedative. They are used to extract Vetiver oil. Vetiver (Chrysopogon zizanioides) is from grass family and it is native to India. Vetiver roots release aroma as they get wet. They are dense in fibre hence they can be used to make wellness products which can provide utility and healing benefits both. Cooling- As these products come in direct contact with body, they heal body with their cooling effect. Vetiver can lower body temperature and help body release excess heat. It is very effective in summer. Calming fragrance- Vetiver fragrance is fresh, soothing and calming. It uplifts the mood and helps to relax. It also helps in sleeping issues, anxiety and stress relief. Natural and Eco friendly- Vetiver products are made with natural fibre which helps you contribute towards greener earth. They prevent the harmful side effects of chemical laden products. Vetiver products provide relief from allergy due to chemicals in synthetic products. These products can also be infused with other herbs, making them more beneficial. Mats: Vetiver mats are made with weaving Vetiver roots together with cotton thread. They usually have cloth trim or based if required. 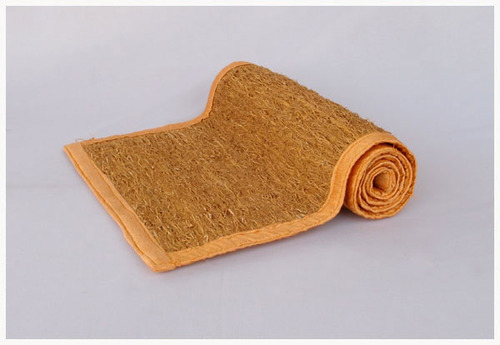 Vetiver mats are very useful for yoga, meditation, prayer or eating food while sitting down. Vetiver mats have cooling effect on the body as they bring body temperature down. While doing yoga, Vetiver mats improve blood circulation and relax joints and muscles. Vetiver has calming and relaxing aroma which create perfect environment for spiritual and balancing activities. Vetiver mats can be customized according to client’s need in various sizes and colour trims. Slippers: Vetiver slippers help in keeping body temperature maintained. As they are made of fibres, they provide mild exfoliation which keeps foot soft. They improve the blood circulation in feet which results in relief from joint pains, numbness and swelling. These slippers absorb sweat, bad odour and keep feet dry and cool. They can be made in different designs with different colour trims and soles according to customer’s requirement. They can be made 100% biodegradable with natural rubber soles and natural fibre trims. Scrubber: Vetiver body scrubbers are made by packing coiled Vetiver roots in a mesh or sewing them with fabric for better hold. Mesh can be made with plastic wired or natural fibres. Vetiver scrubbers provide excellent exfoliating action, resulting in improved blood circulation and dead skin removal. As a natural coolant, they reduce body heat too. Vetiver roots also provide their antiseptic action to get rid of skin problems like acne and help in deodorizing the body. 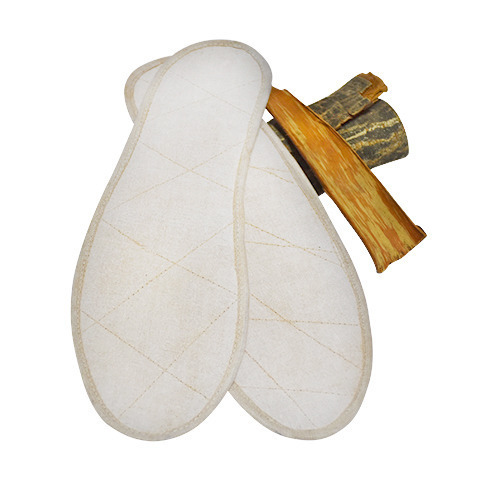 Vetiver scrubber helps in relaxing muscles and provides relief from stress. Other vetiver products: Curtains, stress balls, hats etc. Packaging: Vetiver products can be individually packed in plastic/jute/cotton bags. Packaging can be designed according to customer’s requirement. Products can also have label tags. Usage and care instructions leaflet can be added in the packaging. Private labelling: We can offer vetiver products with your brand name and variety of packaging options. We understand the needs, share and propose ideas to meet client requirement. Bath bombs are solid mixture of dry ingredients which fizzes when soaked in water. They are used to add essential oils, scent and colour to bathwater. They can be in different shapes, colours and fragrances. Bath bombs are infused with essential oil for fragrance and benefits and carrier oil to provide moisture. 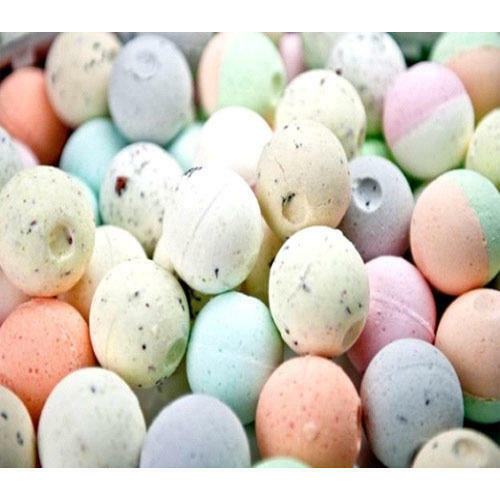 Bath bombs are mostly based on Grape Seed Oil, Avocado Oil and Olive Oil. Bath bombs can be made according to customer requirements. Scrubbing is integral part of skin cares. Scrubbing exfoliates skin to get rid of dead skin cells and stimulate blood circulation which results in supple and healthy skin. Scrubs (known as Ubatan) are recommended in Ayurveda for clearing, softening and adding natural glow to skin. 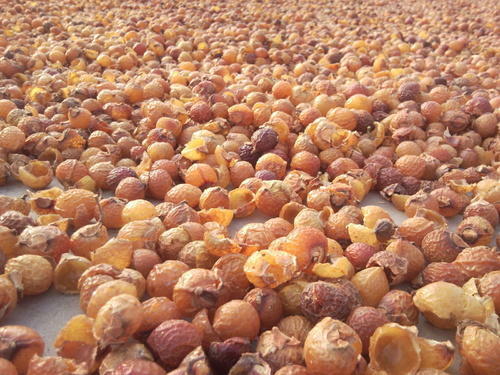 Ubatans were traditionally used in pre wedding skin care regime. Regular use of scrubs helps to diminish marks, prevent fine lines and removes tan. Scrubbing action helps in detoxifying skin. They are perfectly milled to prevent any scratches on skin. Essential oils are also added in scrubs to add fragrance and therapeutic benefits. Natural scrubs polish, rejuvenate and clean skin without any harsh chemicals and their side effects. They are biodegradable, eco friendly and free from environmental hazard micro beads. 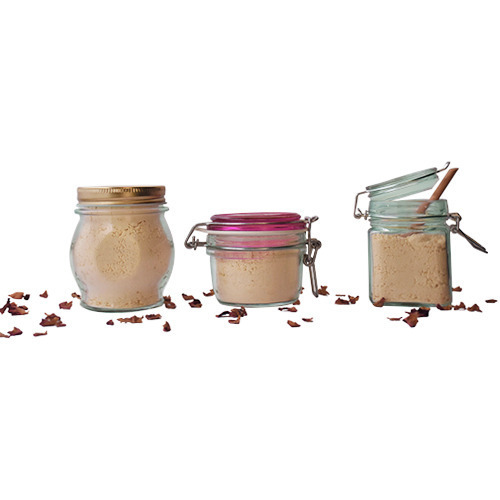 Natural scrubs are made from finest herbal ingredients which are preservative, mineral oil and additives free. Suggested uses: Scrub according to face or body type should be mixed and applied with slow and circular massage. Scrub will exfoliate skin. Scrubs should not be massaged vigorously as it might scratch skin. Skin should be moisturized well after scrubbing to sooth new skin cells. Scrubbing after soaking skin loosens dead skin cells which are easily removed. Scrubs are usually made with fine particles like walnut shell powder, oatmeal, almond meal, corn meal, neem powder, orange peel powder etc. Other herb powders, essential oils, carrier oils can be added according to required benefits. Packaging: At Gingerly, we offer some of the best scrub packaging. Packaging is the crucial stage to maintain the safety and quality. We use advanced packaging solutions that meet hygiene standards and ensure product quality. Packaging can be done in plastic boxes/jars/metal tins/transparent glass/frosted glass/cosmetic jars(with or without lid) of 50 gms-1000 gm. Jars/boxes can be square, round or any other preferred shape. Jars can have plastic/metal lid. Glass/Plastic jars with seal in sizes 50gms-500 gms. Scrubs of different varieties can be packed together to make gift packs/celebration packs. Sachets/packets/jars of various salts can be packed in a compartmentalized box or jars. These can be made of wood, plastic, glass or acrylic. Made with 100% cotton of good quality. Outer cover can be provided for washing. Outer cover can be made in different colours and prints. Buckwheat husk is thoroughly cleaned with no debris, dusts or insects. Good quality zipper is provided to change the amount of filling for maximum comfort. Additional husk can be provided for filling. Neck pain - Buckwheat pillow helps to keep your cervical spine and neck aligned, which helps in alleviating neck pain. It also provides relief in long term neck pain. Stiff neck, sore shoulder, tight muscles can also be prevented by using buckwheat pillow. Buckwheat pillow provides relief in headache as it keeps blood flow to head during sleep regular. It is especially helpful in migraine. Muscle tension - It helps in releasing muscle tension and pain as it keeps your head and spine aligned. It also prevents shoulder and back pain due to wrong sleeping positions. Insomnia - Buckwheat pillow is soft enough to contour well to head and provide maximum comfort. It ensures sound and deep sleep that doesn’t require changing pillow position according to sleep movement. Snoring - It helps in reducing snoring and provides good sleep. Cool head - As these pillows are made of cotton and filled with buckwheat husk, it allows maximum air to pass through which ensures lower head temperature. Cool head helps in keeping body balance and free from stress, fatigue and irritability. It doesn’t make one sweat due to hot pillow. Buckwheat pillows are tightly filled thus are not too soft which can further create problem in neck muscles. They also do not provide too much lift, which causes neck and shoulder pain. Side sleeper - Buckwheat pillows are comfortable for side sleepers too. As buckwheat pillows help to sleep better and without pain, it helps in relieving stress. It also affects emotional well being and overall health. Buckwheat pillow should not be washed. It’ll be difficult to dry and might lose structure. Should not be used if allergic to buckwheat husk. Even though it is easily used by many people with asthma or allergies, should be tested first. Packaging: At Gingerly, we offer packaging concept to completion. We have the experience team to help our clients attain the best fitting pillows with their brand like never before. We are committed in offering various types of best quality Buckwheat pillows. It can be individually packed in plastic/jute/cotton bags. Additional buckwheat husk can be packed in plastic/jute /cotton bags. Pillows can also have label tags. Usage and care instructions leaflet can be added in the packaging. Private labelling: We offer logo printed labels and your desired packaging. We use automatic SS make milling machines, automatic SS filling machine lines, automatic SS make labelling machine. 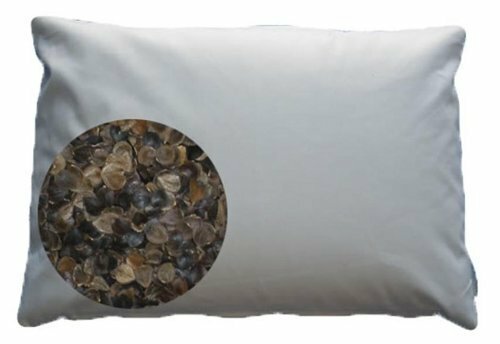 We offer packaging of our vast selection of buckwheat pillow with a variety of packaging options that are labelled with your brand name. Bath salts are powdered minerals and salts added to bath water/foot soaks to provide a relaxing and beneficial experience while adding colour and fragrance to bath water. Bath salts can provide calming, energizing, disinfecting, and anti-aging among many other benefits. They were developed to mimic the natural mineral baths. Most common bath salts are Epsom(Magnesium sulphate), Table salt(Sodium chloride), Baking Soda(Sodium bicarbonate), Himalayan salt, Borax, Sodium Citrate, Dead sea salt, Dendrite salt etc. Skin soaks up these salts well. Glycerine is added sometimes in bath salts as it is great humectants and moisturizes skin well. Some essential oils can also be added to these salts for their fragrance and therapeutic benefits. Dried herbs can be added to bath salts for richer bath experience. Bath salts can be customized in different fragrances and colours according to customer’s requirement. Adding bath salts to bath water makes the bath experience much more relaxing and calming. It can help with sleeping or stress relieving. Bath salts help in lifting mood and feeling positive. Bath salts, especially Epsom salts are muscle relaxant and anti inflammatory. They help with post workout sore muscle relaxation, joint pain and inflammation. They help in healing sprains and bruises too. 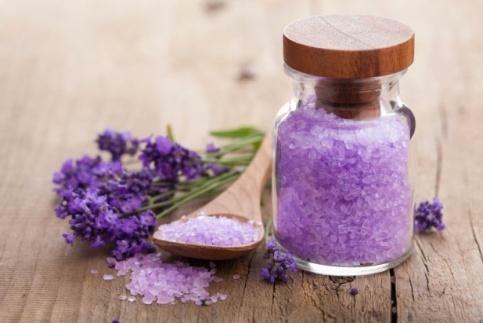 Regular used of bath salts improves blood circulation. It regulates blood pressure and cardiovascular functions. Bath salts exfoliate skin very well. They are helpful in cleaning pores and revitalize skin. As skin is soaked in water mixed with bath salts, it softens. It becomes easier to get rid of dead skin. It is very popular with foot soaks and spa therapies. Essential oils added in salts give a relaxing aroma while providing their therapeutic benefits. eg. tea tree oil added to bath water helps in getting rid of fungal infections, acne, itchy skin etc. Dried herbs added to bath salts release their fragrance and benefits in bath water. Glycerine added in salts works as a lubricant and humectants making skin smooth and supple. Suggested uses: Add salt to bath water (usually warm) and mix. Soak foot (for foot spa) or whole body in bath tub for at least 10-15 minutes to get a rejuvenating bath. Bath salts can be used as an invigorating scrub too. Epsom salt, Dead Sea salt, Himalayan pink salt can be used plain for muscle relaxing and skin enriching benefits. Packaging: Gingerly is a one place site featuring some of the most exclusive bath salts available with customized packaging. Packaging is the crucial stage to maintain the safety and quality of product. We use advanced packaging solutions that meet hygiene standards and ensure product quality. Accessories: Accessories can be added to packs on demand. Aromatherapy sachet can be customized in different fragrances, shapes and sizes. They can be made in cotton/felt/satin/burlap etc. These can be filled with dried plant leaves, flowers, grains or dehumidifying material. They can be packed with essential/fragrance oils for refilling. 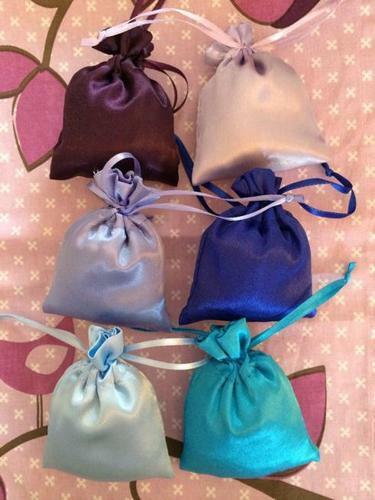 Aromatherapy sachet/pouches can be customized in different fragrances, shapes and sizes. They can be made in cotton/felt/satin/burlap etc. These can be filled with dried plant leaves, flowers, grains or dehumidifying material. They can be packed with essential/fragrance oils for refilling. Cinnamon slippers are traditionally used in Vietnam to fight foot odour. They are made with infusing or layering Cinnamon powder with natural materials for slipper or shoe inserts. When these are used, the essential oil of cinnamon get naturally extracted from powder due to movement and pressure and thus providing its benefits. Shoe inserts or insoles are more popular as they can be worn with any shoe. These slippers can be made of different natural materials like sea grass/straw/cotton/luffa. Shoe inserts are usually made with cotton covering. These can be made in different styles, material and sizes according to client’s requirement. Cinnamon is a natural anti-microbial and anti bacterial agent. It works great in removing odour from feet. Cinnamon in insoles/slippers absorbs sweat and keeps feet dry. Feet feel fresh, dry and without any stink. As Cinnamon is anti-fungal too, it helps in treating fungal infection between toes. Cinnamon has anti inflammatory property which provides relief in rheumatism and arthritis. Cinnamon slippers are made of natural materials which provide light massage on feet. It improves blood circulation and exfoliates dry and cracked foot skin. Cinnamon increases energy levels, vitality and helps in driving away fatigue. Packaging: Cinnamon slippers/Insoles can be individually packed in plastic/jute/cotton bags. Packaging can be designed according to customer’s requirement. Products can also have label tags with size mentioned. Usage and care instructions leaflet can be added in the packaging. Private labelling: We can offer cinnamon slippers with your brand name and variety of packaging options. We understand the needs, share and propose ideas to meet client requirement.